Where can Huck and I go to get chicken fried steak on a Friday? Nick & Rudy’s has it on Tuesday. I think the Pie Wagon has it on Monday or Tuesday. But I don’t know where’s got it either all the time or on Friday. Pie Wagon had chicken fried steak! Woo hoo.For those of you unfamiliar with chicken fried steak, it’s basically the South’s take on weiner schnitzel and it is delicious and a perfect way to celebrate one’s blogoversary. 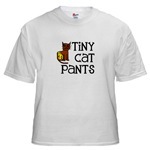 Today is the blogoversary of the founding of Tiny Cat Pants. What I’m having a hard time wrapping my head around is that it’s only been two years. Last night the Yellow Brand Hammer Company was over and he was all like “What’s going on in your world?” and I couldn’t think of a damn think any different than the last time I’d seen him. And yet, when I think about what my life was like before I started blogging, it was vastly different and a lot less fun. It makes me excited for the future. Who knows what will come of things? My only regret is that I have so much of the blog sitting over there at Blogger. I wish everything were together in one spot. I hope you guys are enjoying it, too. I feel really lucky and honored to have such awesome friends and readers. Comments, criticisms, requests, questions–post them below and I’ll try to address them.